Markdown is a simple but versatile text editor, that allows formatting text, inserting hyperlinks, references, and images. Math equations are rendered with MathJax LaTeX. After you complete your edits, please provide a title of change (will appear in the node history), and, if the change is extensive and would benefit from clarification, its detailed description, and then "Commit changes". You can also exit without committing the changes, but keeping your work as a draft (drafts are also saved automatically every 30s). Next time your open the node for editing, you will be notified of having uncommitted draft. 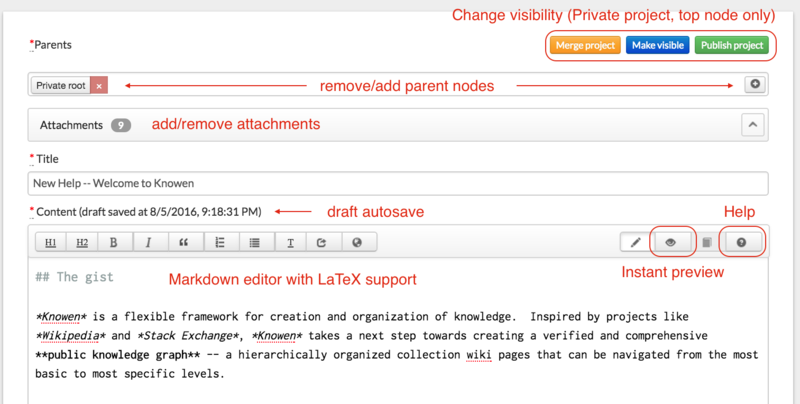 Note that editing in Knowen is sequential, in order to avoid conflicts and preserve complete record of changes by individual authors. When you open a node for editing, other users will not be able to start editing until your commit your work, or exit editing without committing changes. One author can recall editing from another, if the latter takes too long. The active author will be notified by the system, and will have 10 minutes to commit changes. Any uncommitted changes will be preserved as personal drafts. No work is lost.